A smile just crossed my face when I saw this image. I perceive it as an excellent mingling multiple things. Of how science helped these women to be a step closer to their religion, by helping them actually see the eclipse. 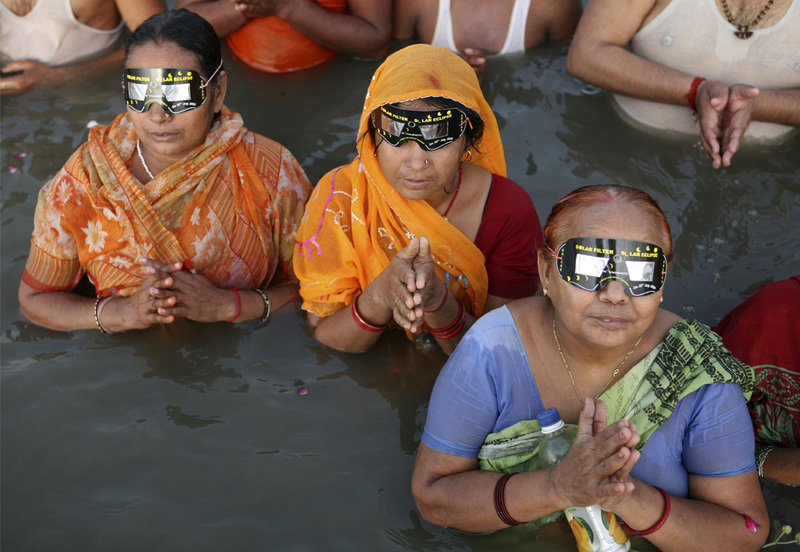 Of how science is helping these women to break the myth of religion of solar eclipse being a bad omen, by actually giving them means to observe it. Of how people are so steadfast in their religion, that even though they know whats causing the eclipse (I presume so), they are still a believer and fold their hands in respect. Of how women are ahead of men ;). Of how technology has permeated into the grass roots. Women, who are usually not exposed to and tend to shy away from technology, are comfortable using it.